Upper Blue Elementary Staff and Students are proud to announce that we have earned the authorization to offer the Primary Years Programme (PYP) of the International Baccalaureate (IB)! We are now an official IB World School! As part of the authorization process, UBE has been implementing phases of Primary Years Program since the 2003-04 school year. the attributes of the IB Learner profile. We act with integrity and honesty, with a strong sense of fairness and justice and with respect for the dignity and rights of people everywhere. We take responsibility for our actions and their consequences. We understand the importance of balancing different aspects of our lives—intellectual, physical, (spiritual) and emotional—to achieve well-being for ourselves and others. We recognize our interdependence with other people and with the world in which we live. Attributes that we want students to value and demonstrate. As a Caring Community, we should be modeling, looking for, and recognizing authentic demonstrations of the PYP attitudes in our children's daily lives. 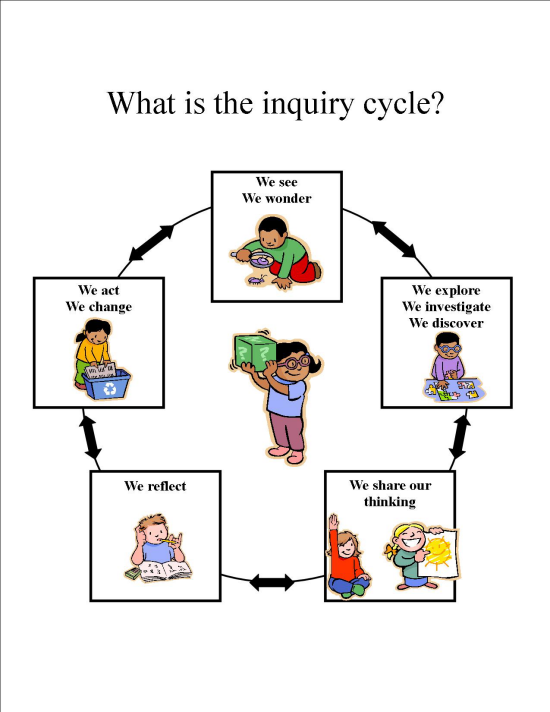 At the heart of the PYP is a commitment to structured inquiry as a vehicle for learning. According to Nancy Cecil in The Art of Inquiry, "When children see to ask or answer questions about things for which there are many potentially correct answers, they begin to develop an attitude of appreciation for the immensity and complexity of the natural world." Teachers at each grade level develop units of study that center around the six transdisciplinary themes. These themes help guide teachers as they plan and design transdisciplinary (combining two or more subject areas) units of inquiry which make up the Program of Inquiry. Within these units, children are encouraged to ask questions, are taught how to use a variety of resources to seek answers and led to a deeper understanding of the topic being studied. The PYP seeks to create students who are not bounded by the physical borders of their community. Instead it works to study broad topics that can have an application in any part of our world. An inquiry into the nature of self; beliefs and values; personal, physical, mental, social, and spiritual health; human relationships including families, friends, communities, and cultures; rights and responsibilities; what it means to be human. An inquiry into our rights and responsibilities in the struggle to share finite resources with other people and with other living things; communities and of the relationships within and between them; access to equal opportunities; peace and conflict resolution. An inquiry into the interconnectedness human-made systems and communities; the structure and function of organizations; societal decision-making; economic activities and their impact on humankind and the environment. An inquiry into the ways in which we discover and express ideas, feelings nature, culture, beliefs and values; the ways in which we reflect on, extend and enjoy our creativity; our appreciation of the esthetic. An inquiry into the natural world and its laws; the interaction between the natural world (physical and biological) and human sciences; how humans use their understanding of scientific principles; the impact of scientific and technological advances on society and the environment. Un cuestionamiento dentro de la naturaleza del ser; sus creencias y valores; salud personal, física, mental, social y espiritual; las relaciones humanas incluyendo familias, amigos, comunidades y culturas; derechos y responsabilidades; que es lo que significa ser un humano. Un cuestionamiento dentro de nuestros derechos y responsabilidades en la lucha por compartir los recursos finitos (limitados) con otras gentes y con otras cosas vivas; las comunidades y las relaciones dentro y entre ellos, el acceso a iguales oportunidades; resolución de paz y conflicto. Un cuestionamiento dentro del lugar y del tiempo; historias personales; casas y jornadas; descubrimientos, exploraciones y migraciones del género humano; las relaciones interconectadas entre los individuos y las civilizaciones, de las perspectivas locales y globales. Un cuestionamiento de las interconexiones de los sistemas y comunidades de origen humano; la estructura y función de las organizaciones; tomar decisiones sociales; actividades económicas y su impacto en el género humano y en el ambiente. Un cuestionamiento dentro de las maneras en las cuales nosotros descubrimos y expresamos las ideas, sentimientos naturales, cultura, creencias y valores; las maneras en las cuales nosotros nos reflejamos, nos extendemos y disfrutamos de nuestra creatividad; nuestra apreciación de la estética. Un cuestionamiento dentro del mundo natural y de sus leyes; la interacción entre el mundo natural (físico y biológico), y las ciencias humanas; como los humanos usan su entendimiento de principios científicos; el impacto de los avances científicos y tecnológicos en la sociedad y en el ambiente. 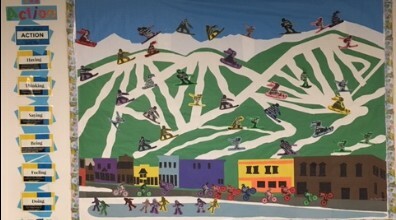 The ACTION CYCLE is an important component of the PYP. 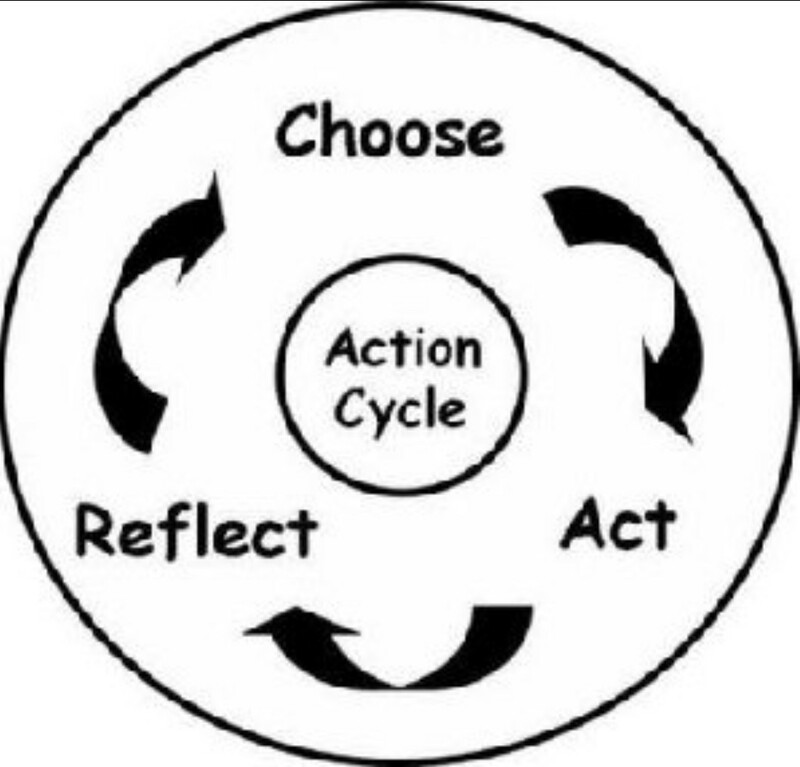 At Upper Blue we encourage students to act on what they are learning through the action cycle: REFLECT, CHOOSE, and ACT. By reflecting on learning, students then can make a choice and take action. Student initiated action is an extension of their learning. Action demonstrates deeper thinking, it might mean doing something, But it could also just mean have a different understanding... Whatever the action might be, it should be an extension of their learning. If you notice your child taking action RELATED TO THE CURRENT UNIT OF INQUIRY, please fill out the slip at home with your child after he/she has completed an action and send it back to school. What was the student action? Doing = Because of your new knowledge have you DONE something? Having = Because of your new knowledge do you have MORE of something? Thinking = Because of your new knowledge have you THOUGHT differently? Changed your mind? Wondered? Inquired? Saying = Because of your new knowledge have you SAID something? Informed? Explained? Told? Discussed? Debated? Asked? Being = Have you BEEN a different person? Changed behaviors? Been more patient? More respectful? Feeling = Have you FELT differently? Empathized? Loved? Felt Inspired? Worried? Admired? El CICLO DE LA ACCIÓN es un componente importante del PYP (Program Anos Primarios). En Upper Blue animamos a los estudiantes a poner en práctica lo que ellos aprenden. Mediante el CICLO DE ACCIÓN: REFLEJAR, ESCOGER, Y ACTUAR. Reflejando en lo aprendido, les permite a los estudiantes poder escoger y después actuar tomando acción. Cuando el estudiante toma la iniciativa, eso es una extensión demostrando su aprendizaje. Acción demuestra pensamiento profundo, puede significar el hacer algo, pero también puede significar otro tipo de compresión. Cualquier acción debe ser el resultado del aprendizaje. Si usted se da cuenta que su estudiante está tomando acción en RELACIÓN CON LA UNIDAD DE INVESTIGACIÓN ACTUAL, por favor de rellenar en casa con su hijo/a en formulario de ACCIÓN y regresarlo a la escuela.